Independent online outlets are overtaking newspapers as sources of news and opinion. Alan Austin explained why here. Today, he nominates Australia’s best online publications. THERE ARE AT LEAST nine online publications worth reading regularly. For those, that is, serious about tracking events in Australia, following developments abroad and understanding Australia’s place in the world. For readers keen also to participate in debates, all nine welcome discussion. Three accept submissions from the informed public. Before naming the winners, however, a few observations about the new milieu. No wonder, then, that Fairfax's and Murdoch’s print regimes are under great pressure. More than 30 of Australia’s top 100 online news outlets are from outside Australia — including China, Russia, Indonesia, New Zealand and India as well as many from the US and Britain. The top news sites by online readers are still dominated by the established media. The five highest media sites ranked by traffic are news.com.au (Murdoch), www.smh.com.au (Fairfax), ninemsn.com.au (Nine Network), www.abc.net.au (ABC) which includes online forum The Drum and www.theage.com.au (Fairfax). They have others as well. Readership levels of the alternatives are catching up, but have a way to go. About a third of the most popular news sites focus on one special interest — sport, lifestyle, entertainment, food, IT, business, women and men. This adds greatly to the pressure on print news sales. Recent entrants include The Guardian Australia, The New Daily, The Citizen, The Stringer, The Big Smoke, Margo Kingston’s No Fibs, the Socialist Alternative’s Red Flag and The Saturday Paper. The latter two – crazy brave, perhaps – have print editions as well. Of these, only the first two and the last have managed to get into Australia’s top 10,000 sites, so challenges lie ahead. Gone include Café Whispers, which has shifted its readers to The AIM Network, and The Global Mail which died a death almost as spectacular as its birth in early 2012. Readerships have fluctuated dramatically in the past year. The Hoopla took the plunge and asked for payment. This led to a sudden fall from the top 2500 Australian sites in April to ranking around 4500 today. Winners include Crikey, which despite a paywall has risen steadily in the rankings from around 900 a year ago to 350 today. Independent Australia has steadily increased its reach since its inception four years ago last month and is now in the top 1300 in Australia, and the top 100,000 sites globally – joining only Crikey, The Guardian and The New Daily in that echelon among alternative outlets. New Matilda almost folded in May having failed to find readers and financial security. Since former editor of Tracker Chris Graham took over, readership has increased, moving from ranking around 6000 to near 2500 in recent weeks. So what are the must-read free sites for accurate reporting and for analysis not paid for by big tobacco, the big polluters and the big tax dodgers? 1. The Guardian Australia features excellent reportage inside and outside Australia. Obviously benefitting from Wotif’s Graeme Wood’s backing, it has signed on strong writers and snaffled the grimly hilarious First Dog on the Moon (Andrew Marlton) from Crikey. Breaking the dramatic story last November – along with the ABC – of the 2009 Indonesian spying scandal greatly boosted its emerging profile. 2. The Conversation seeks to source academics who are specialists in topics of popular interest. 3. Independent Australia is a news magazine that engages in serious investigations, has covered multiple issues barely acknowledged by others and has reported fairly matters seriously distorted elsewhere. These include the state of Australia’s economy, the Peter Slipper and James Ashby matters, Jacksonville and the Craig Thomson saga, and the shadowy world of rightwing astroturfers — amongst many other topics. '... ethical, verifiable, fiercely honest reporting and speaking truth to power. He says the results of this approach have been obvious. 'Our rise in readership is due, I believe, to us being a chink of light shining through a murky cloud of Murdoch misinformation. We get it right far, far more often than not — and that's why people trust us. 4. The New Daily was launched last November with funding from Australia’s superannuation industry. Understandably, along with regular news and analysis it focuses on national finance, personal finance and wellbeing. 5. On Line Opinion is an established leader in citizen journalism, with about 25 writers per week, few of them professionals. It achieves this charter and looks great but, as mentioned earlier, often struggles to build an audience. Recently, however, it has been instrumental in uncovering several important stories, including the Frances Abbott scholarship affair. Names include Mike Seccombe, Guy Rundle, Richard Ackland, David Marr, Hamish McDonald, Paola Totaro, Robert Manne and cartoonist Geoff Pryor. Pretty big, but mostly blokes. 8. From rank outsider a year ago, Michael Taylor’s highly accessible The AIM Network is another of this year’s readership winners. Main topics – on which amateur contributions are accepted – include politics, refugees, the media and climate change. 9. Jesuit-funded Eureka Street has many committed Catholic contributors — but not all. Its analysis of current social and political events is invariably sharp, well-researched and current. Editor Michael Mullins told IA it serves Australians interested in religion, ethics and issues affecting the marginalised, especially asylum seekers. There are, of course, many others, as the discussion following is welcome to consider. Plus there are countless excellent and influential bloggers these days such as The Kouk, Wixxyleaks, Peter Martin, John Menadue, David Horton, John Quiggin and Andrew Elder. Some of these writers have been identified by IA as exceptional and are frequently republished on IA. 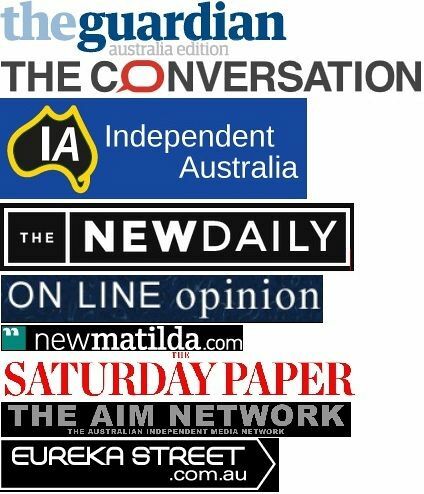 Will increasing access to all these reliable sources force Murdoch and Fairfax to change their news model? Will these alternatives continue to flourish? Or will some flounder? These things we shall observe objectively and report truthfully. Disclosure: The author worked for several years with ABC Radio. He has recently made paid contributions to Crikey, The Global Mail, Eureka Street, New Matilda and Independent Australia; and unpaid contributions to The Drum, On Line Opinion and The AIM Network. You can follow Alan Austin on Twitter @AlanTheAmazing.